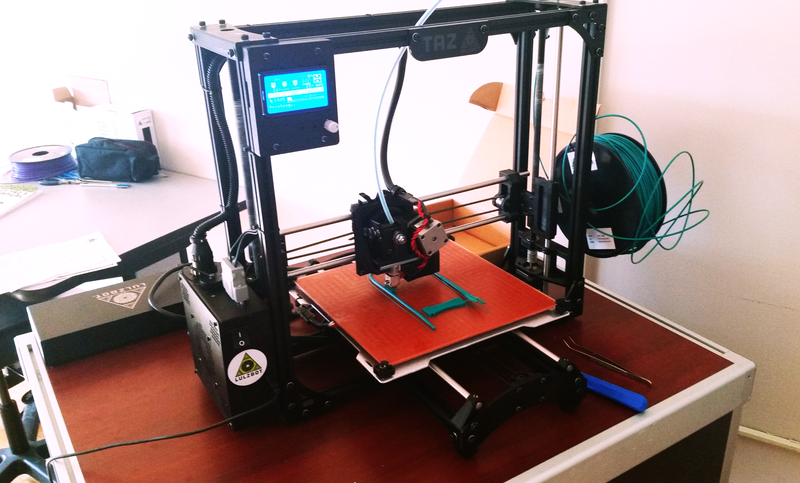 This is a guide to using the 3D printer at Nash Library. Fill out the Printing Request Form online, and we will print your object for you and notify you when it is ready to pick up. The 3D printer is in the Poolaw Room/Makerspace, which is on the south side of the main floor. A file specifying a 3D object's design is uploaded into the printer. A tube of colored plastic filament feeds into the printer. The end of the filament is heated so the plastic is liquified, and the printer lays down extremely thin layers of the liquid plastic. The layers harden and are built up to form the 3-D object. Anyone in the USAO community (students, faculty, & staff) may use it. Objects printed for a USAO class are free. All other objects cost $.50 per 10 grams of object weight. You may pay for your objects when you pick them up. Our printer is a Lulzbot TAZ 5. What colors of plastic can be used? We have green, purple, orange, natural, red, black, and silver. Our printer prints objects in one solid color. If you want your object to be multicolored, you can paint your finished object. What file types can it print? Our printer can print .stl files. Make sure the file you want to submit is this type. Where do I find files to print? Browse the sites in the "Find 3D Printing Designs" box to find objects designed by other people, or use the sites in the "Make a 3D Printing Design" to get free software that will let you design your own object.There are other sites and software you can use; these are just a few recommended sites. These are collections of objects other people have designed. They are user-generated and may or may not have been tested. This site searches through 3D printing designs from many different 3D printing sites. Mixture of free and for sale designs. Use categories at top to navigate. Set up a free account to download files. Mixture of free and for sale designs by professionals. Use Discover tab to browse by type. Set up a free account to download files. All free designs; site associated with MakerBot. This site offers many free and paid models; this is a link to the free ones. They offer many file types besides the .stl format our printer takes, so enter.stl in the formats search to find objects you can print on our printer. You can use these to design your own object to be printed. One of the Autodesk tools. Use basic shapes as building blocks to design objects. No download required.